We usually don't make a big deal out of anniversaries, but I think after the disaster of our 25th, this one had to go better! 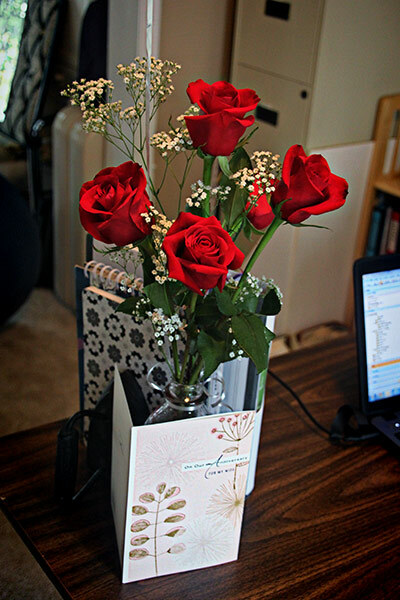 Yesterday he brought home a dozen red roses. This morning he gave me a beautiful card. I separated the flowers into two vases so I could have some in the kitchen and some in the office. I almost never get to enjoy flowers in my office! (This counts as #1 A Bouquet of Flowers for Rinda's Scavenger Hunt). Tonight we are going out to dinner. Trying out Bonefish Grill which is new to us. Waiving Hi to Sian and all the other Monday waivers. Happy Anniversary! You were a beautiful bride---and still are! Enjoy the day! Congratulations! Over here 30th anniversary is Pearl, you have to wait until the 60th for diamonds I think - how lucky that your traditions are different, enjoy shopping! We are celebrating 35 years in September- such a long time eh?! Love that photo of your wedding day. Happy Anniversary! Here's to many more years.. Happy Anniversary Cheri! Here's to many more ahead. So sorry to be so late catching up with you!!! I would have told you to order a glass of sangria at Bonefish---it's home-made and the best---and I'm not all that crazy about sangria! The fish tacos are incredible. The key-lime pie has a pecan crust and is delicious. It's the only key lime pie I'll splurge on---not a lover, generally. As you can tell, we love the place. We take any out-of-towners who have never been!! How did you like it? Happy belated Anniversary to you and your husband! The flowers he gave you are beautiful! I like your wedding picture - and of course the Grand Cayon is always wonderful! The flowers are lovely! 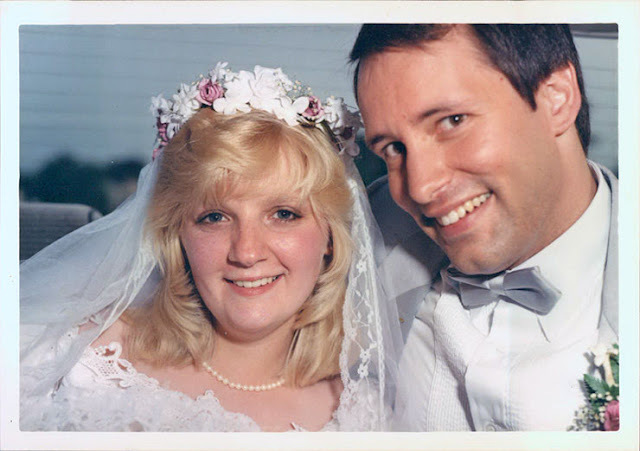 Congratulations on 30 years together - y'all make a great couple! Now . . . do tell about the diamonds!!! Happy Anniversary to you both, lovely photos of both the wedding and now. I will look forward to seeing your anniversary gift!